The Sheldon Regional Airport is located two miles north of Sheldon on Northwest Boulevard. New Airport Administration/Terminal Facility constructed in 2008. They added a large 80′ X 90′ hangar in 2011. The City of Sheldon has a courtesy van available for pilots to use to get around Sheldon and to other nearby cities. 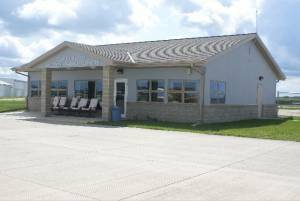 Every Labor Day, as part of the Sheldon Celebration Days, the Sheldon Regional Airport has a flight breakfast.